A year and a half ago I put together a system built with some pieces I purchased from the Trenton Computer Festival. It was a server though, pretty loud, very heavy, and the hardware was a couple years old when I bought it so became out of date pretty quickly, and the Xeons were too old to have virtualization. When I decided to move I also decided to replace it and have the parts delivered here in SF. Yesterday I put together the new machine. 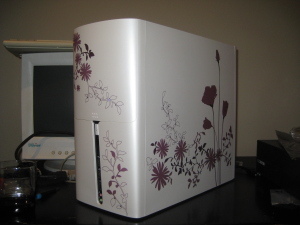 It’s the In Win Allure case, with light purple flowers and Swarovski crystals! I felt a bit silly spending over $100 on a case that doesn’t come with a PSU, but I really couldn’t resist after seeing how gorgeous it was. I put it together on Thursday and tossed in a couple harddrives from my old machine. Unfortunately I was running 32-bit Ubuntu on that old machine so it looks like I’ll be reinstalling with 64-bit probably next weekend so I can actually use that 8G of RAM and I’ll be swapping out my 500G EIDE with a 500G SATA I have. 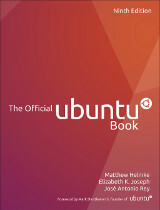 This entry was posted on Saturday, February 20th, 2010 at 12:19 am and is filed under computers, pink, ubuntu planet. You can follow any responses to this entry through the RSS 2.0 feed. Both comments and pings are currently closed. That’s a very nice case! I’m going to link this to my sister, she will love it. Thats what I thought: my sister will really dig this. I’m sending her the link now. Spending some money to make something look really nice is quite often worth while, I’ve regretted once or twice only spending money on making something functional and then having to look at something ugly for a while. Looks really good! I thought the Intel Core i7 processors used triple channel memory? Or is that just for optimal performance and it will also work with 2 channel memory? I knew someone would mention the CRT! :) I just moved here and my flatscreen monitor hasn’t arrived yet, had to dig an old CRT out of storage for now. Not sure about the memory (dual vs triple), but it’s working great so far. The Core i8xx has dual channel memory (no triple channel). You probably should replace the video card. It makes a lot of difference (e.g. buy a Nvidia Geforce GTX 260 or ATi Radeon HD 4890). Cute case. I’d been wondering why you were getting a new computer so soon (I’m obviously catching up on your blog posts. I just noticed recent status messages on Facebook). I’m glad you popped for 8GB of RAM. I’m a little sick of people telling me that I only need half that. I wish I had the patience to build my own. I opt for 2nd best and dealt with a place that does custom computers. They ‘re one of those that lets you pick everything (down to the brands models of all the parts). The also give you a choice of operating systems (Windows, Ubuntu, or Fedora – or none at all). I went for Ubuntu at the time only to show my support for a vendor what will install Linux (I’d have otherwise saved $20.00 and gone for no OS at all). I’ve been very happy with my baby which I’ve had for almost 19 months now. I spent over $100.00 on my case also (although I don’t recall exactly what it cost me anymore. I know it was at least $150.00). OK, I’ll stop babbling now….. Entries (RSS) and Comments (RSS). 23 queries. 0.097 seconds.